GROGNARDIA: What Ho, Jack Vance! Rather than stretch the term "pulp fantasy" beyond the point of credulity, this week's literary post won't formally be part of my Pulp Fantasy Library series but rather a stand-alone musing. It was occasioned by my reading of several old interviews with Jack Vance in which he talked about the authors who most influenced him. Often, it's been claimed, not without plausibility, that Clark Ashton Smith was one of these influences, but I've never read anywhere in which Vance acknowledges such an influence. Instead, Vance has consistently named three (sometimes four) authors as his literary "mentors:" Jeffery Farnol, L. Frank Baum, and P.G. Wodehouse (with Burroughs being the fourth). Of these influences, the one that stands out as the odd is P.G. Wodehouse. Baum wrote fantasies (as did Burroughs) and Farnol, though largely forgotten nowadays, was a popular writer of swashbuckling tales in the first half of the 20th century, so there's a clear connection to Vance's own work. But what of Wodehouse, a comic writer best known for having created the character of Reginald Jeeves, a gentleman's gentleman whose very name is now synonymous with knowledgeable and perspicacious manservants? What sort of influence could he have had over Vance? 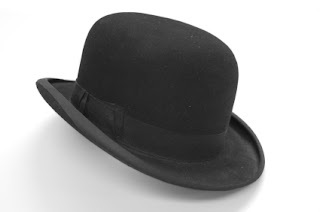 I'm actually a devotee of Wodehouse, whose Jeeves stories I am now in the midst of re-reading (which is what occasioned this post). In doing so, the connection between the two writers has quickly become apparent. First and foremost, Wodehouse displays a remarkable facility with the English language, one that humorously combines sophisticated banter with the then-contemporary slang of London partygoers. The combination is often dizzying, taking some time to understand, but, once one gets the hang of it, Wodehouse's dialog reveals surprising depths. Reading the words of Cugel the Clever, you can hear echoes of Wodehouse. Wodehouse's characters likewise show many commonalities with those in Vance's works too. Whether they're foolish authority figures, puffed-up aristcrats, or zany eccentrics, many of them would, without too much effort, fit right into Vance's fantasy and science fiction tales. Of course, Vance's tales have a decidedly "darker" edge to them. Their humor is often of a black sort and Vance's characters generally possess a venal streak beneath their buffoonery. Still, the influence is quite clear once you begin to look for it. I've amused myself while re-reading the Jeeves stories by picking out little bits of dialog that remind of something said in "The Dying Earth" stories. I fear that this practice has carried over into my gaming as well. My NPCs were always of a somewhat whimsical sort to begin with, but my immersion in Wodehouse these last few days has only stoked my whimsy further. The spoon-fancying priest of Typhon, Saidon, is probably one of my more Wodehousian creations and his reappearance in a recent Dwimmermount session gave me the opportunity to indulge myself yet again. Wodehouse, like Vance, is likely an acquired taste and I can sympathize with anyone who doesn't find his writing as appealing as I do. Still, if you like well crafted dialog and eccentric characters, you could do worse than reading a story or two by the man. If nothing else, you might end up, as I did, naming an alchemist Marmaduke and enjoying the look on your players' faces when you first say the name to them. Another interesting thing to remember about Vance- he also wrote murder mysteries under the pen name Ellery Queen. Yes, that Ellery Queen. You can see the influence in the awesome start to the second Cugel book, where the house he works is a classic mystery set up. Although not seemingly related at first, after perusing a tome of old Mr.W one's brain pan does not boggle at the notion of its wordy influence on Vance. Wodehouse is quoted as an influence by lots of SF&F writers from Asimov to Pratchett, so I'm not surprised any more when he's cited. Vance also enjoys depicting terrifying aunts and other termagant females - surely a trick he learned from Wodehouse. Although I don't remember seeing an interview where Vance admitted a debt to Clark Ashton Smith, there are interviews where he tells of waiting for the latest issue of "Weird Tales" as a boy. Vance certainly didn't take much from HP Lovecraft so I suspect Smith was the writer who most impressed him in that magazine. Need to track down my source, but I distinctly recall that Vance doesn't care much for Smith's style but does enjoy the man's imagination. This was probably part of an interview. Yes and it is a shame that the monsters most noticeably absent from Vance's Bestiary of the Dying Earth are *AUNTS*. Perhaps Vance was reluctant to introduce into his work such a note of utter horror. I've managed to handsell a few Jeeves & Wooster books where I work, but it's hard going to make the sell in our benighted age. "Jeeves & Wooster & ZOMBIES!" would probably sell much more easily. Not surprisingly, I've sold quite a few more BBC J&W DVD sets than J&W books. I'm with you regarding Vance's darker edge. In fact, it made going through his Dying Earth books pretty tough going since I couldn't find any reasons to cheer on the blackhearted utterly nihilistic Cugel, nor, for that matter, Rhialto and his precious, preening peers (speaking of guys named Smith . . .). All I had left in the last three DE books was Vance's nonpareil style, especially in the dialogue (which can be said, in my experience, of most of Vance's books - he could never figure out how to actually end a story to save his life - they always felt like power going out in the theater right after the bad guys dies but with still 30 seconds to go before the credits start to roll). Happily, my first Vance books were the Lyonesse trilogy, a straight-up fantasy which was where my first introduction to Vance-ian magic was. Where they differ from the Dying Earth books, however, is in that the Lyonesse books have heroes that one can actually root for. He still does his cleaver-on-the-block ending in the third book, but "Lyonesse" is his "Code of the Woosters," the cream(er) of the crop. Your criticism is nuncupatory! Yeah, JV tends to, paradoxically, simultaneously rush and peter out toward the end in most cases, but the journey is so, so awesome that the destination can be forgiven. The dialogue does have a distinct Wodehousian feel to it, and Ruskin's descriptive prose has also been cited as an influence. I would recommend hunting down Richard Tiedman's essay "Jack Vance, Science Fiction Stylist" for some additional reading on the subject. > It was occasioned by my reading of several old interviews with Jack Vance in which he talked about the authors who most influenced him. Barker for one didn't seem to think that particularly important but, anyhow, from a RPG p.o.v. what Vance did have by way of framework (rather than literary mode) was a map. Not overarching plotlines or history, just a map and stories written/rewritten (prior to publication) in that world. Actually, somewhere in storage I have a collection of essays done on Jack Vance - it's got an ugly orange cover and came out in I think the early 80s. I think Ruskin's may have been one of those. Also, I'd heard about this but didn't know it was finished. > Also, I'd heard about this but didn't know it was finished. Good plug, +thx. I'd missed the update, too, but was where I found out the original mss. for The Dying Earth was still officially "lost". An extraordinary amount of focused work in that project relative to what the whole of our hobby has received. I love Wodehouse and more than one D&D character of mine has been a thinly veiled ripoff of a character from one or another Wodehouse tale. Also, I've always wanted to make feasible some kind of stage, or at least radio adaptation of something or another from Dying Earth...it just seems to be...dying...to be spoken. Vance's prose is eccentric but he's actually a lot more in tune to the rhythms of the english-speaking ear than many more straightforward writers. "Plum" was famously well-intentioned. There's a probably apocryphal story that when he wanted to post a letter, he would just drop it out of a high window, assuming that someone woudl find it and pop it in the post box for him. In some sense, Vance took PG's tool and turned it absolutely around. Cugel is kind of Bertie Wooster gone to seed. Alan Moore did a Jeeves and Wooster meet the LoEG and Cthullu in The Black Dossier. I believe you are overanalyzing this. The connection to Wodehouse is clear. Almost all of Vance's space opera novels can rightly be classified as a "comedy of manners" (Nightlamp, Ports of Call/Lurulu, the Alastor series, the Tschai). And this is exactly the type of work that Wodehouse wrote. Read how the cultures are portrayed on the different planets. It is obvious. "On the occasions when Aunt is calling to Aunt like mastodons bellowing across primeval swamps... the clan has a tendency to ignore me." Librivox has lots of Wodehouse audiobooks for free. Most are good if not great, esp. for free, and more than just J&W. Mhmm... some of those influences from Wodehouse in Vance were also passed along to Barker (synthesist par excellence) it seems, since The Dying Earth did play a non-trivial part in the history of Tekumel: obvious enough comparing post-1950 material with earlier content there, anyhow.